Prez to Prez was created in November 2006 to encourage and support Presvyteres of the Holy Orthodox Church in faith, in love, and in relationships with their husbands and families. After a hiatus from January 2012 through September 2015, we are very happy to announce that Prez to Prez is once again being offered. We welcome your feedback. Feel free to write with your comments or ideas. Click here for archived issues of Prez to Prez. Thought for the Day: Shake it up a bit! We’re always following rules and routines —social, lawful, business, familial, religious, personal. That’s just what mature faithful presvyteres do. We stick to the guidelines necessary to maintain harmony, to avoid getting in trouble, dutifully attend services and to keep the organized, consistent patterns we as human beings crave. We love our routines, and generally shy away from change or spontaneity. But sometimes we can get too accustomed to our everyday. Do you remember brushing your teeth this morning? Do you remember last Sunday’s sermon? We become so ingrained in our habits that we find ourselves operating on autopilot, which is the death of mindfulness. If you’re like me, you keep roughly the same daily schedule, traveling, praying, eating, working, relaxing at around the same times, and performing the same tasks over and over again in about the same ways, so that before you know it, another week has gone by, then another month, and so on. Of course there are occasions here and there to break the monotony, but if we’re lucky, this is the kind of contented, predictable way we go about things. This is our normal. There’s nothing wrong with that—but what if we could appreciate it more, and take less for granted? What if we could inject more Christlike mindfulness into our rote actions? Imagine, during Great Lent, if we can challenge ourselves to expand out of our “comfort zone” a bit and try new things, being more open to others’ needs and opinions. We want to suggest stretching routines/introducing some flexibility or "breathing room" to allow the Holy Spirit to work in new ways. Let’s challenge ourselves this week to shake it up a bit - so that we can come to recognize with more awareness our loving God in our day to day. More awareness for Christ. More awareness for YOU, His beloved daughter. Great Lent offers us countless opportunities for prayerful reflection. But, are we truly taking time to mindfully engage? If you normally take the bus/train or drive to work or on your way back from dropping your kids off from school, try getting off at a different stop or parking on a different street and walking that route to your destination. Take in the beauty of spring in the air. Take time to appreciate the storefronts, greenery, people, etc. that you don’t even see anymore. Take time to make a coffee date with someone outside your parish, and reach out to a new friend. Go to bed an hour earlier and give yourself a few more minutes time to read Scriptures and pray in the morning. What activities will you fit in during that extra time? Forget your lunchtime regimen—eat popcorn in the park while reading Lenten Reflections until you have to go back. Don’t –gasp!—set your alarm. Stretch a few of your rules. Doing so will allow you to look at your world with a renewed sense of consciousness, and it could even inspire you to make some changes in your spiritual routine. The ultimate goal is to increase your connection with God and be mindful even through the most mundane moments, so that you can be fully present to living a life in Christ. Question for the Day: What is one way I can "shake it up" this week? If more than one possibility comes to mind, why not live "dangerously" and sprinkle them out over the next few weeks? Who knows, it may inspire us to find additional ways of shaking it up! We are thrilled to welcome Presvytera Michelle Triant as a new member of our Prez to Prez Team! If you are interested in submitting a “Thought” for the day - please email us at p.tsagalakis@comcast.net. We welcome your input and feedback. A blessed Lent to you and your families, our dear sisters in Christ! Isn’t it amazing that St. John Kronstadt wrote about the “passion for distraction” over 100 years ago? Imagine what St. John would say today if he thought people were getting distracted 100 years ago! How much more are his words a serious warning and challenge for us today about distractions. As we prepare to fast during the beautiful journey of Great Lent, let’s do our best to UNPLUG and lessen our attention to our cell phones. Often, if we forget to bring our phones on a quick trip to the grocery store, or leave it behind before heading off to work, we feel a sense of panic. “What if I miss a call? What if I don’t check my texts for the next 4 hours?” It’s amazing how tied we are to our devices! During the start of Great Lent, let’s UNPLUG and wean ourselves from our normal sites on Social Media and the distraction of our phones and computers. Instead, let’s focus on connecting more intimately with our Lord and Savior. May we begin to slow down, unplug, and plug in time with our Lord instead of time checking facebook posts and our newsfeed. Making an effort to prioritize prayer and reading of scripture will bring us closer and closer to Christ. If you are on line, choose opportunities to grow in your faith, along with your family! What distractions have the greatest foothold in my life? (Try asking your loved ones for their input as well...sometimes they see our distractions far more clearly than we do!) Am I willing to hand these distractions over to God? How would God have me use the time I will regain? This past year, a theme for me has been relationships. In particular, it has been a season in which there have been some very difficult and complex relationships in my life. In speaking with some sister presvyteras, I discovered that we clergy wives may be drawn into difficult and complex peoples’ orbits simply because of our leadership status. So: how do we approach the suffering that is caused by “relationships”? While many of life’s struggles and/or losses are common to all, “relationship” pain can seem intentional, or at least, personal. It may include unkindness, rancor, or even competitiveness or deceit from someone we are in close contact with, from colleagues to family members to friends. Popular self-help literature isn’t much help here: most of the “expert” advice in this genre tells us to steer far away from the energy-draining person and simply turn our attention to positive influences. There’s a problem with that. Christ didn’t model it. In our lives as priest’s wives, we do, I believe, become more comfortable over the years with the practice of walking with others in their suffering. We learn to trust God for His presence and comfort, within the experience of suffering. We may even have witnessed some unexpected blessings and incredible beauty that arises out of struggle. This beautiful effort on our parts does, however, require our own willingness to be vulnerable, on behalf of another. And that very vulnerability which is a strength in many situations, can leave us feeling unprotected with interactions with difficult people. I have discovered that I must consider how to place some healthy boundaries. An ongoing struggle can become depleting for us, for example. And our willingness to be vulnerable does not mean that we allow a progression of ugly behaviors to overtake us. To be clear, I’m referring to wounded people who may lash out, and not to truly abusive situations. Of course, we pray for our “difficult person”. They are unhappy and wounded and not at their best. We can and should step back, and take care of ourselves physically, getting enough sleep, exercise, and nourishing food. We can also take time for our own positive relationships, those that glorify God. We can seek after Stillness. Isaiah 30:15 says,” in returning and rest you shall be saved; in quietness and confidence shall be your strength.” Stillness, I have become totally convinced, is the key to Christian identity. We regain our hope via His daily love for us! We find ourselves much more stable if we re-prioritize our daily time with Christ, and defend this priority fiercely! “You cannot be too gentle, too kind. Avoid even appearing harsh in your treatment of each other. Joy, radiant joy, streams from the face of him who gives and kindles joy in the heart of him who receives…..Instead of condemning others, strive to reach inner peace. Keep silent, refrain from judgement. This will raise you above the deadly arrows of slander, insult and outrage and will shield your glowing hearts against all evil.” Wow. These two treasures, stillness and gentleness, are so countercultural and yet so very powerful. And I have found, they truly can work wonders, in these difficult relationships. So, unless the Lord places me in a broken elevator with my difficult person, I have learned to wait for the tempest to subside, or to refer the person to the true authority, the priest. While Christ offered many examples of firm correction, He also knew people’s hearts and thoughts; we do not. May the Lord shine his light upon our lives! May this year be one in which we offer ourselves to God with joy, knowing that we have such a beautiful privilege before us as the wives of Orthodox priests! Question for the Week: How am I seeking stillness and practicing gentleness in my daily life? What are some steps I can take to cultivate these actions and make them part of my daily walk? Life is full of unexpected discoveries. Sometimes I wake up in the morning and feel virtuous. That is, I feel good and kind and charitable. All is calm and I am at peace. Oh how bitter it is to be suddenly splashed with the cold water of reality. A child defies my instructions. Another ignores me. Suddenly the thin veneer of patience is stripped away and the ugliness inside rears its menacing head. Indignation, anger, then rage! Sin. I frantically tread water in the onslaught of despairing thoughts. It’s not me! It’s them! Why do I have to bear this! I don’t deserve to be treated this way! But with each passing idea, I am drifting farther away from the safe shores of humility. Now I am in the sea of misery. Lord Jesus Christ, have mercy on me. Lord Jesus Christ, have mercy on me. Lord Jesus Christ, have mercy on me. There is no other way back. The hardest part is accepting this ugly root of pride in me. I don’t want to face it as my own. But everything I do to reject the presence of the sin only pushes me away from my healing. I flail miserably in a swirling ocean, refusing let go of my self. Miserable, yet trapped—it seems there is no help for me. Suddenly, something nudges me--is it a prayer of a treasured saint? Is it the intercessions of a loved one? Something sheds a ray of light on my heart and I cry out, “Help me, Lord! I’m drowning!” And like Peter, I feel a hand, pulling me out of peril. And I am saved. Wishing you a blessed Holy Week and Joyous Pascha! Thought for the Day: Isn’t it amazing that St. John Kronstadt wrote about the “passion for distraction” over 100 years ago? Imagine what St. John would say today if he thought people were getting distracted 100 years ago! How much more are his words a serious warning and challenge for us today about distractions. Question for the Day: What distractions have the greatest foothold in my life? (Try asking your loved ones for their input as well...sometimes they see our distractions far more clearly than we do!) Am I willing to hand these distractions over to God? How would God have me use the time I will regain? We can practice Gentleness. Yes, Gentleness! This was such a revelation to me. St. Seraphim of Sarov says: “You cannot be too gentle, too kind. Avoid even appearing harsh in your treatment of each other. Joy, radiant joy, streams from the face of him who gives and kindles joy in the heart of him who receives…..Instead of condemning others, strive to reach inner peace. Keep silent, refrain from judgement. This will raise you above the deadly arrows of slander, insult and outrage and will shield your glowing hearts against all evil.” Wow. Christmas! We glorify the Merciful God! God the Father sent to us His Beloved Son. And He fulfilled all the promises of His Father. Angels brought the good news to the shepherds. God’s Light and their songs enlightened their minds. A wondrous star led the Magi from the East to the Child. In a dream, God told them to ignore Herod the King. We hymn and honor the Birth of the Son of God. We joyously glorify God the Father for His great love. He saved us through His Son, with His compassionate love. Our words are inadequate to express our thanksgiving. For His many blessings to us and indescribable compassion. Let us welcome and worship Him as the innocent children. “Christ is born, glorify Him…! Alleluia! Glory to Thee! Let us proclaim the angelic message, Peace and Joy! Our earth needs His peace--His healing and Blessing. Christ is born! Be compassionate and joyous, Brethren! God’s Word is Incarnate on earth. Believe and glorify Him! May our humble prayer with thanksgiving reach God. May He bless us as He blessed the innocent children. Question for the Week: As we celebrate the Nativity of our Lord, how can I be more compassionate and joyous this week? When in the throes of a crisis or perplexing problem, it is sometimes difficult to remember the above proverbial dictum. I can say with confidence, as I look back on my life, that it is absolutely true. In my 7th decade of life, 5th decade of marriage, and 4th decade of service as a Presvytera, hindsight is a commodity that I have in abundance. I could fill volumes with my life’s stories to prove my faith in this proverb. At this time, I will share one. Not long after the birth of my third child in 1976, I began to experience severe dizzy spells. Undergoing many medical tests failed to provide me with any explanation. Eventually, the dizziness went away and I was able to immerse myself in the duties of parenthood and parish life. Through the next many years, mysterious physical pains and maladies came and went without explanation. My children were convinced that it was all in my head, that I was a hypochondriac. I knew otherwise. The course of our lives and ministry eventually took us to Guatemala in 1999 to celebrate the marriage of our son at the Hogar Rafael Ayau orphanage in Guatemala City. (That is another long story.) It was there that we met Jenny, an 11-year-old orphan who stole our hearts. Although we were already grandparents, and in fact, old enough to be Jenny’s grandparents, we adopted her the following year. A few months after bringing Jenny to the U.S., I began to have more strange symptoms. My doctor thought I was having mini stokes and hospitalized me for testing. After many tests, including MRI and a spinal tap, the verdict came back that I had multiple sclerosis. The doctors felt that the onset had been 25 years earlier, explaining all my previously unexplained symptoms. How would this affect my newly adopted motherhood of Jenny? I decided to trust in the Lord and to not lean on my earthly understanding of medical matters. There was a reason that God had kept this information from me. If I had this diagnosis earlier, I would not have had the courage to adopt and raise a young, emotionally needy child. God would make this path straight for me. It was, after all, a path that He had chosen for my life. And now, Jenny has grown into a beautiful, successful womanhood, is married to a wonderful young man, and recently blessed us with her first child — our 13th grandchild. God continues to bless me and make straight my paths. At my last visit to my neurologist, he studied the most recent MRI of my brain and said, “You’re fascinating!” Of course, what is fascinating to a doctor is not necessarily a good circumstance for the patient. He continued, “There’s so much wrong with you, but you’re functioning so well.” To this I responded, “With God’s help.” Five years ago, my husband retired from parish ministry and we are currently devoted to mission work in Guatemala with the Mayan people. It is a great blessing to be a part of this historical development, where Orthodoxy is growing by the thousands of faithful. The paths that God places in our lives might not always be easy, but He WILL make them straight for us. May God bless you, my Sister Presvyteras, and make straight your paths, and may my story give you hope. QUESTION FOR THE WEEK: When in my life have I had to trust in the Lord to make my paths straight? As I reflect back on that time now, how does it make me feel? Have I shared this story with someone else? Is there someone in my life who is struggling and would benefit from hearing the message of God's faithfulness? Christ is Risen!! We have just passed the finish line of our 2017 Lenten Journey…the journey that brought us to Pascha…the most important time of the year! 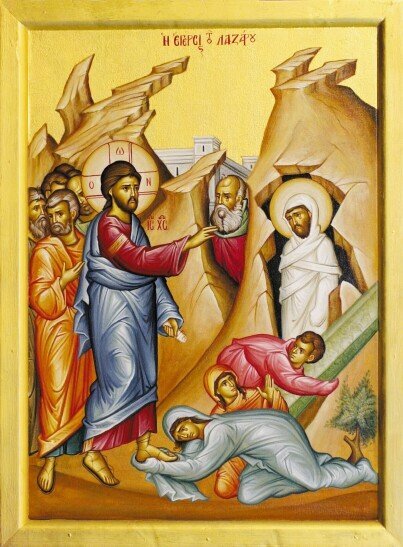 St. John Chrysostom says of in his Catechetical Homily read at the Liturgy of the Resurrection: “Let all of you enter into the joy of our Lord…. The table is richly laden. All of you, fare sumptuously on it,” let’s take a moment to reflect on the journey that has gotten us here. As Orthodox Christians, we travel this road annually but each time it is different. It is like the annual vacation trip. Each year we see there are new things to discover on the road and because it has been a year, even the old things are new again. It is supposed to be that way. Our journey through Great Lent should be fresh and new each year. Like Lamentations 3:22-23 says: “The steadfast love of the Lord never ceases, His mercies never come to an end: they are new every morning: great is Your faithfulness.” God does not change but we do. Depending at what season we find ourselves in will determine a lot of how our journey goes. As a single woman, I often enjoyed a more focused and disciplined Lenten journey and had time to participate in services and read spiritual books and meditate on spiritual things. Later when I married and was blessed with children the Lenten season changed. I couldn’t be as focused on services and had no time to read books, yet the journey was still there for me. My focus was more on my young children. I found that for the “mommy” season of my life, my job was to help my girls experience their personal Lenten Journey along with me. You and I also have another job, one that does not end and one that impacts our journey. That is the role of Presvytera. Though each of us may treat this role differently it still is part of us and still makes a mark on our journey. In thinking back over my many journeys to Pascha, I now realize those “mommy” years were just as important in my spiritual growth as the ones when I was single. Of course, many years and even now, I felt and feel like a failure. I struggle maintaining my fast and disciplines and to tell you the truth, I was and still am a failure… but the journey wasn’t and isn’t a failure. Each year is new and different and fresh and regardless of my poor attempts of maintaining a spiritual discipline, God still reveals Himself to us! We are constantly learning about ourselves and God’s mercy, maybe more so in the failure years. It is at the end of these difficult journeys that we cherish even more the words of St. John Chrysostom: “You who fasted, and you who did not, rejoice today. The Table is richly laden. All of you, fare sumptuously on it. The calf is a fatted one; let no one go away hungry. All of you enjoy the banquet of faith. All of you enjoy the riches of His goodness.” I am now, again, at a new and different season of my life. My girls are grown and gone. My journey now is more of what I had when I was single. I have more time. However, I am a different person today than I was then. We grow through all the nuances that the seasons of our lives bring. Yes, each of us experience a personal journey depending what season of life we are in. Yet, we also share this journey. We share it as women and as Presvyteres. Let us walk beside each other. Let us be there for one another. Let us support and help each other. Remember the journey is not for our awesome God … He doesn’t need it, but WE do and often we need each other’s help to find our way to the destination. Rejoicing with you, as a fellow traveler on this journey to Pascha where we eat together from the richly laden Table of Life! Christ is Risen!!! “If at some time you show mercy to someone, mercy will be shown to you. If you show compassion to one who is suffering (and of course, this is not a great deed) you will be numbered among the martyrs. If you forgive one who has insulted you, then not only will all your sins be forgiven, but you will be a child of the Heavenly Father. If you pray from all your heart for salvation – even a little – you will be saved. If you rebuke yourself, accuse yourself, and judge yourself before God for your sins, with a sensitive conscience, even for this you will be justified. We are all equipped with the innate ability to feel compassion and altruism toward others, right? If that is the case, why is it so hard to feel this supposed natural emotion when someone hurts us, or someone that we love? It’s as if compassion can be turned off in our hearts just like a switch, the moment we get offended. Although, this is has been a controversial issue, it is generally accepted by scientists that we are born with benevolence. But as we age, and gain an increased awareness about people and their motivations, we make assumptions that we don’t even realize we have made. We learn that everyone doesn’t always have our best interest in mind and, with this realization, it becomes increasingly more difficult to express these types of positive feelings. It almost feels threatening! Try attempting to feel compassion towards someone this week when you don’t feel that compassion and benevolence is being reciprocated towards you. It’s hard, right? When someone is hurtful toward us, our minds seem to naturally get stuck on negative thought patterns that leave us reasoning that the person who hurt us simply doesn’t deserve our compassion. What is the result? We fight (or hurt) back or we distance ourselves emotionally as a means of protecting ourselves from those who hurt us. But is this defensiveness really protecting us? Does fighting back to teach someone their wrongs really help? Do we actually feel better? Do others who have wronged us really see that their ways are flawed? Researchers and spiritual leaders assert that violent, aggressive or otherwise offensive people are really just people whose compassion and benevolence was never developed. Compassion, they say, is really no different than language acquisition. We are all born with the propensity to learn and develop this skill, if placed within an environment that nurtures its development. It would seem then, that people who offend us and/or act with aggression and hostility are people whose sense of compassion was never nurtured and therefore lays dormant, just waiting to be activated. Ghandi said it best when he said, “Be the change you wish to see in this world.” Offer compassion even when it is not being received. Set your mind on good things when it’s going down a dark path. Practice compassion with the same kind of discipline that you use to accomplish other challenging goals in this life. To cultivate compassion when you are having trouble feeling it, set your mind on positive thoughts. “Don’t repay evil for evil. Don’t retaliate with insults when people insult you. Instead, pay them back with a blessing. That is what God has called you to do, and he will grant you his blessing” (1 Peter 3:9). Let your attention be drawn toward other positive aspects of your day, other positive relationships in your life, other positive aspects of that person and/or other positive moments that exist in your life. Unstick your mind from the righteousness you feel that really only serves to keep you feeling bitter. It is not your job to make others see their wrongs and change their ways. Sometimes, practicing compassion can have more of an impact in this world than any other response you might give in the hopes of seeing change. Most people change when they gain self-awareness. Self-awareness occurs for most, when other people don’t add to the mix. In this way, others may see themselves and we may maintain the peace that has been granted to us by the almighty Lord and savior Jesus Christ. Question for the week: To whom in my life do I have difficulty showing compassion? Am I willing to cultivate compassion towards them as part of my Lenten journey this year? How do I think it will impact my life and the lives of those around me? We are all equipped with the innate ability to feel compassion and altruism toward others, right? If that is the case, why is it so hard to feel this supposed natural emotion when someone hurts us, or someone we love? It’s as if compassion can be turned off in our hearts just like a switch, the moment we get offended. Although, this has been a controversial issue, it is generally accepted by scientists that we are born with benevolence. But as we age, and gain an increased awareness about people and their motivations, we make assumptions that we don’t even realize we have made, we learn that everyone doesn’t always have our best interest in mind and with this realization, it becomes increasingly more difficult to express these types of positive feelings. It almost feels threatening! Try attempting to feel compassion towards someone this week when you don’t feel that compassion and benevolence is being reciprocated towards you. It’s hard, right? When someone is hurtful toward us, our minds seem to naturally get stuck on negative thought patterns that leave us reasoning that the person who hurt us simply doesn’t deserve our compassion. What is the result? We fight (or hurt) back or we distance ourselves emotionally as a means of protecting ourselves from those who hurt us. But is this defensiveness really protecting us? Does fighting back to teach someone their wrongs really help? Do we actually feel better? Do others’ who have wronged us really see that their ways are flawed? I think Ghandi said it best when he said, “Be the change you wish to see in this world.” Offer compassion even when it is not being received. Set your mind on good things when it’s going down a dark path. Practice compassion with the same kind of discipline that you use to accomplish other challenging goals in this life. To cultivate compassion when you are having trouble feeling it, set your mind on positive thoughts. “Don’t repay evil for evil. Don’t retaliate with insults when people insult you. Instead, pay them back with a blessing. That is what God has called you to do, and he will grant you his blessing” (1 Peter 3:9). Let your attention be drawn toward other positive aspects of your day, other positive relationships in your life, other positive aspects of that person and/or other positive moments that exist in your life. Unstick your mind from the righteousness you feel that only serves to keep you feeling bitter. It is not your job to make others see their wrongs and change their ways. Sometimes, practicing compassion can have more of an impact in this world than any other response you might give in the hopes of seeing change. Most people change when they gain self-awareness. Self-awareness occurs for most, when other people don’t add to the mix. In this way, others may see themselves and we may maintain the peace that has been granted to us by the almighty Lord and savior Jesus Christ. Questions for the Week: Who is one person in my life with whom I struggle to show compassion? What does it "cost" me to withhold compassion from this individual? How could extending compassion to this individual affect me? Am I willing to be a tool of God's compassion for this person? Thought for the week: This summer, we had the opportunity to travel to Greece. As a priest and presvytera, it is always a joy to visit churches and attend services in new parishes especially in an Orthodox Christian country. While on the island of Naxos one evening, we drove by a beautiful church and stopped when we saw crowds of people gathered around the entrance. We found out that they were celebrating the feast day of St. Nicodemus (July 14) who is from the island of Naxos and canonized in 1955. When I walked into the glorious church covered with spectacular iconography and many people praying together, I was overtaken by the smell of beeswax and the hundreds of candles lit by the faithful who had entered the vespers service before me. I began to reflect on all the candles I had lit in my years as a presvytera. Countless prayers have been lifted up, inviting Christ to fill me and those in my church family, with His peace and light. My husband is always the first to enter the church and light the first candle. Often times, when I walk in through the doors of Holy Apostles Church on Sunday morning to sing Orthros, there is just one lone candle ablaze. I stand grateful that my husband faithfully leads me and others along this journey of faith. I know it is sometimes a thankless and difficult job to be priest. I am able to "receive the light" because he first, has ignited the initial flame. Being a clergy couple, we are often called upon to diligently keep the flame of faith lit and to encourage others to follow and seek the light of Christ. At times, we can feel alone and unsure. Yet, as the faithful enter one by one, to light their candles the blaze grows bigger and bigger. We are a community - who together, walk this sacred path towards salvation. We are not alone. Each candle lit, reflects our common need for Christ and our willingness to show up and seek Jesus together. Next time you enter the church, say a prayer and light an extra candle for your priest "who offers the light of Christ to all. May you - a beloved diakonessa or presvytera, be encouraged to stay faithful, bright and strong, together we can all strive to be "radiant as the stars in heaven" ablaze with joy so to become shining examples of love and peace in this broken world. Question for the Week: If I had a candle that represented the fervor of my faith right now, how would I describe the strength of the flame? Is it fully ablaze? Is it struggling as the winds of life buffet it or the shadows threaten to overtake it? Has it been snuffed out? If so, how can I allow the Lord to re-ignite me with His perfect fos?